Absent from the OED as it then existed, this seemed to Clark another word which was worth recording, embedded as it was in what could seem a national scrutiny of identity in terms which reflected whether one was able – or willing – to fight. Enlistable – yet another form still absent from the OED – was similar. ‘now it is just the right material that’s offering: the young unmarried fellows,of decent physique’. 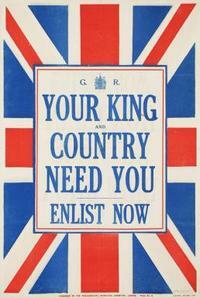 Lord Kitchener’s appeal for men to make up a New Army was, in this light, strikingly successful. Other anxieties about not being enlistable or recruitable – and the public consequences this might bring – had, however, also started to emerge. By the end of August 1914, the more opprobrious diction of the shirker had, as Clark’s notebooks confirm, tellingly made its appearance. it suggested the provision of a badge for those who had not been allowed to enlist. Rendered badgeless, real shirkers could, in effect, be named and shamed. as the Daily Express proclaimed on 1 Sept 1914. As Clark explained, the construction to show the white feather had long been in existence – it was, as he noted, the proverbial expression for those who were deemed to lack the necessary courage. The First World War nevertheless gave the opportunity for the proverbial to be literalised. As Clark notes with scarcely concealed disapproval, white feathers were indeed given out to those men who seemed enlistable, but who were not at the front, as a badge of dishonour and shame. As the Star reported on Saturday 5th September, the white feather brigade had, ‘in the cause of patriotism’, already become far too active. Asquith too had, it reported, expressed his disquiet at tactics such as these. As we will see in Clark’s later notebooks, and the language that these record, such hopes were, however, to be in vain. ** A new entry in OED Online (dated 2009) now provides the history and use of this term, taking it back into the nineteenth century and forward to 2007, even if its use in WWI does not receive specific mention. See “recruiting, n.” OED Online. Oxford University Press, September 2014. Web. 11 September 2014.